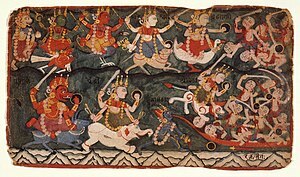 The Goddess Ambika or Durga Leading the Eight Matrikas in Battle Against the Demon Raktabija, Folio from Devi Mahatmya, Markandeya Purana. The Puranas (Sanskrit: पुराण purāṇa, "of ancient times") are Hindu religious texts that are part of the Vedas. They contain narratives about the history of the Universe from creation to destruction and the genealogies of kings, heroes, sages, and deities. Some of the Puranas are discourses on cosmology, geography and Hindu philosophy. They are usually written in the form of a dialogue. Vyasa, the narrator of the Mahabharata, is traditionally considered the compiler of the Puranas. The earliest written versions were compiled during the time of the Gupta Empire (4 - 6 century CE) and much of the material may be dated, through historical references and comparative studies, to this period and the succeeding centuries. The texts were collected from all over India and because of the similarities that are found throughout the texts, it is not possible to trace the line of influence of one Purana upon another, so the corpus is best viewed as a synchronous whole. The date of the earliest written texts does not define the date of origin of the Puranas. They were transmitted orally before being written down, while at the same time, they have been modified well into the 16th century and beyond. Serious work on the Puranas began when the All India Kashiraj Trust was formed under the patronage and guidance of Dr. Vibhuti Narayan Singh, the Maharaja of Kashi, which, in addition to producing critical editions of the Puranas, also published the journal Puranam. Sarga: the creation of the universe. Pratisarga: secondary creations, mostly re-creations after dissolution. Vamśa: genealogy of the gods and sages. Manvañtara: the creation of the human race and the first human beings. The epoch of the Manus' rule, 71 celestial Yugas or 308,448,000 years. Vamśānucaritam: the histories of the patriarchs of the lunar and solar dynasties. Some scholars have suggested that these 'distinguishing marks' are shared by other traditional religious scriptures. The Puranas also lay emphasis on keeping a record of genealogies. The Vayu Purana states that in ancient times the Sūta (Sanskrit:सूत bards of Puranic stories) preserved the genealogies of gods, rishis, glorious kings and the traditions of great men. According to Pargiter (1922), the "original Purana" may date to the time of the final redaction of the Vedas. and Pargiter (1979) Pargiter has argued that the Puranic Krta Yuga—in the Vayu Purana the four Yugas are divided into 4800, 3600, 2400, and 1200 years—"ended with the destruction of the Haihayas [by Rama Jamadagnya]; the Treta began approximately with Sagara and ended with Rama Dasarathi's destruction of the Raksasas; and the Dvapara began with his reinstatement at Ayodhya and ended with the Bharata battle". In Arrian's Indica, Megasthenes (Greek Historian born c. 350 BC died c. 290) is quoted as stating that the Indians counted from Shiva (Dionysos) to Chandragupta Maurya (Sandracottus) "a hundred and fifty-three kings over six thousand and forty-three years." The list of kings in Kalhana's Rajatarangini goes back to the 19th century BCE. Nevertheless Gavin Flood (Professor of Oxford University, Hindu Studies and Comparative Religion) connects the rise of the written Purana historically with the rise of devotional cults centring upon a particular deity in the Gupta era: the Puranic corpus is a complex body of materials that advance the views of various competing cults. Although these texts are related to each other, and material in one is found in another, they nevertheless each present a view of ordering of the world from a particular perspective. They must not be seen as random collections of old tales, but as highly selective and crafted expositions and presentations of worldviews and soteriologies, compiled by particular groups of Brahmins to propagate a particular vision, whether it be focused on Viṣṇu, Śiva, or Devī, or, indeed, any number of deities. The Puranas are available in vernacular translations and are disseminated by Brahmin scholars, who read from them and tell their stories, usually in Katha sessions (in which a travelling brahmin settles for a few weeks in a temple and narrates parts of a Purana, usually with a Bhakti perspective). Bhagavata Purana (18,000 verses). One of the most celebrated and popular of the Puranas, telling of Vishnu's ten Avatars. Its tenth and longest canto narrates the deeds of Krishna, introducing his childhood exploits, a theme later elaborated by many Bhakti movements. Skanda Purana (81,100 verses), the longest Purana, it is an extraordinarily meticulous pilgrimage guide, containing geographical locations of pilgrimage centers in India, with related legends, parables, hymns and stories. Many untraced quotes are attributed to this text. The Upapurāṇas are lesser or ancillary texts: these are sometimes also said to be eighteen in number, with still less agreement as to the canonical titles. Few have been critically edited. They include: Sanat-kumara, Narasimha, Brihan-naradiya, Siva-rahasya, Durvasa, Kapila, Vamana, Bhargava, Varuna, Kalika, Samba, Nandi, Surya, Parasara, Vasishtha, Devi-Bhagavata, Ganesha, Mudgala, and Hamsa. The Ganesha and Mudgala Puranas are devoted to Ganesha. The Devi-Bhagavata Purana, which extols the goddess Durga, has become (along with the Devi Mahatmya of the Mārkandeya Purana) a basic text for Devi worshipers. There are many others all over the Indian subcontinent. This corpus of texts tells of the origins and traditions of particular temples or shrines—the word sthala means "spot" in Sanskrit. There are numerous Sthala Puranas, most written in vernaculars, some with Sanskrit versions as well. Some appear in Sanskrit versions in the Mahapuranas or Upapuranas. Some Tamil Sthala Puranas have been researched by David Dean Shulman. These Puranas deal with a caste's origin myth, stories, and legends (the word kula means "family" or "tribe" in Sanskrit). They are important sources for caste identity though usually contested by rival castes. This subgenre is usually in the vernacular and may at times remain oral. These have been little researched, though they are documented in the caste section of the British Census of India Report and the various Gazetteers. Jain Puranas deal with Jain myths, history and legends and form a major part of early Kannada literature. The best known is the Mahapurana of Acharya Jinasena. ↑ See for example Castes and Tribes of Southern India vol. I–V, Thurston Edgar. Cosmo Publication, Delhi. Dimmitt, Cornelia; van Buitenen (1978). Classical Hindu Mythology: A Reader in the Sanskirt Puranas. Philadelphia: Temple University Press. ISBN 8170305969. Handoo, Jawaharlal (editor) (1998). Folklore in Modern India. ISBN 81-7342-055-6. Flood, Gavin (1996) (Book). An Introduction to Hinduism. Cambridge University Press. ISBN 0521433045. Majumdar, R. C.; Pusalker, A. D. (1951). The history and culture of the Indian people. 1: The Vedic age. Bombay: Bharatiya Vidya Bhavan. Mittal, Sushil (2004). The Hindu World. Routledge. ISBN 978-0415215275. Moghe, S. G. (editor) (1997). Professor Kane's contribution to Dharmasastra literature. New Delhi: D.K. Printworld (P) Ltd.. ISBN 81-246-0075-9. Pargiter, F.E. (1922). Ancient Indian Historical Tradition. London: Oxford University Press. Pargiter, F. E. (1962) (Book). Ancient Indian historical tradition. Original publisher Oxford University Press, London. Delhi: Motilal Banarasidass. OCLC 1068416. Rao, Velcheru Narayana (1993). "Purana as Brahminic Ideology". in Doniger Wendy (Book). Purana Perennis: Reciprocity and Transformation in Hindu and Jaina Texts. Albany: State University of New York Press. ISBN 0-7914-1381-0. Singh, Nagendra Kumar (1997). Encyclopaedia of Hinduism. ISBN 8174881689. This page was last edited on 11 December 2018, at 13:49.